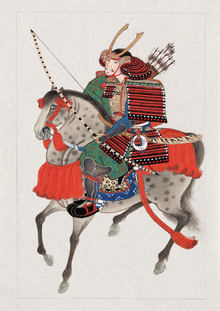 Yabusame is a type of mounted archery in traditional Japanese archery. An archer on a running horse shoots three special "turnip-headed" arrows successively at three targets. with bow & arrows, wearing a horned helmet. It's very similar to samurai and mongolian horse archer and has differences. i will fix the horse later. Revive! We need to continue this unit since SunriseSamurai spreading the Japanese Units Today. MightyGuy wrote: Revive! We need to continue this unit since SunriseSamurai spreading the Japanese Units Today. Lol I do like this idea. And why would I ever spread Japanese units, to attempt to make it so you can viably use them the same way you can use Romans? This unit is too particular right now. It does 12 damage max in a normal turn (not that good), for a cost of 5. Except it has 200% against the basic swordsman troop tree. That means each attack will do 12 damage, which means that it does 36 damage total to these troops. I'm actually looking at it from the idea of how it works with my daimyo suggestion. +2 damage at 3 attacks gives it a bit more purpose. If blacksmith techs helped it, that's even better. Though I think it should just have bonuses as per horse archers. I Agree, 50% Bonuses In 6 Damages And 3 Action Turns. Great, now it is ready for voting.